Creative marketing and great customer service are no longer enough to succeed in today’s competitive business environment. In a digital world where competitive offers are readily available at the touch of a smartphone, customer experience must become your brand. Look only in the rear view mirror, and you may have missed the opportunity to make a positive difference. Learn how to uncover new levels of predictive and actionable insights, deliver impactful and timely experiences that customers want and value, while making smart investments in the customers that need your attention. 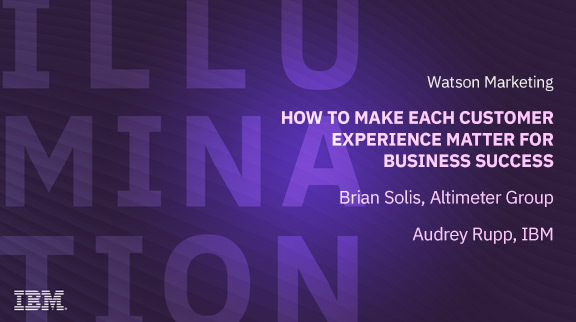 Join us for an exclusive webinar hosted by Brian Solis, Principal Analyst at Altimeter Group, keynote speaker, and author of “X: The Experience When Business Meets Design,” on how to cultivate and market meaningful customer experiences. Discover how to get ahead of your customers and make each touchpoint matter.